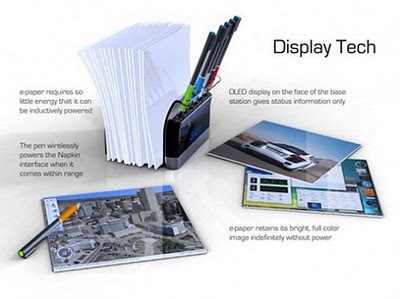 Napkin PC is a concept designed by Avery Holleman, the basic idea is getting information processed and displayed on a flexible and ‘scrollable’ e-ink like napkin paper as the display. The e-napkin papers are also connect-able for a larger display similar to matrix system for LCD display. You could also pin up the napkin to display on a white board to retains image indefinitely and eliminate the need of printing and paper wasting. 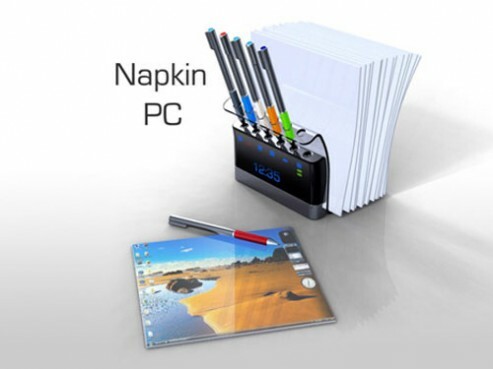 And base on Holleman’s design approach, we guess this Napkin PC’s display should be something affordable for average designer’s or general public’s pocket budget. 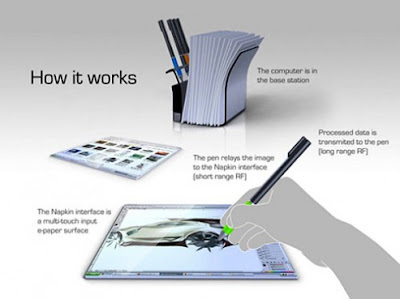 There are special pens designed to let user for do group interactive collaboration or discussion on the design or draft or their idea, where each pen will transmits drawings or writings to a base station, which is a PC in disguise. 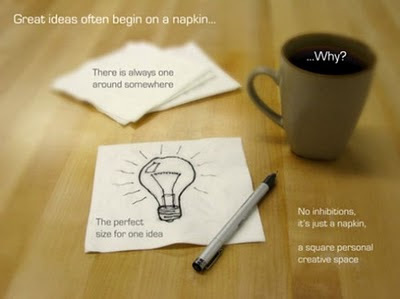 The question, however, would nowadays’ Wi-Fi technology support to fit into the flexible and ‘scrollable’ e-napkin?